When someone talks about the Diablo Drought, Breakpoints, Amp, BotD or mentions EIAS. What do you do? Naturally, any remotely sane community member would pretend s/he did know what was said and sneakily check out the Abbreviations page in DiabloWiki! The drought simply implies we get litte attention from Blizzard, a breakpoint is where things start to get better, Amp is a Necro skill, BotD is a runeword and EIAS is the actual attack speed you end up with after all modifiers. 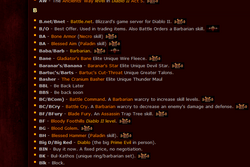 There are literary hundreds of terms relating to gaming, Diablo, Diablo II and Diablo III. Naturally, we mostly have terms related to Diablo II since this is the game most of us have played, but there are already Diablo III terms budding. It’s a gaming cultural heritage in the making! Make sure you check out both the Abbreviations article as well as the more elaborate Glossary, and bookmark them for future use. Being a “gaming cultural heritage in the making”, this is also a fantastic opportunity to make your mark as the library of phrases is expanding. Make sure to add anything that’s missing, and help us making “stub” articles on what they mean and how they are used. This thread can also be of help, if you need to ask about “candidate” words, or anything about wiki editing.